We're still alive. Thought I'd let you all know before a new decade begins. 1) Elijah's sleep habits have changed - and not for the better. We think it's actually a good thing - in that it seems to be a developmental change (he wants us to stay and snuggle him all night). Regardless, we're pretty tired as we try to figure out why our bad sleeper (turned good sleeper) has become a bad sleeper again. 2) Andy and I have been working with a nutritionist on a diet and exercise plan for a few weeks now. It takes time to be healthy, to exercise, and to count calories. Although I'm really tired because of reason number one and sometimes feel overwhelmed by trying to change our lives, I'm really happy that we're making this change for our health. Not too long ago, I was sitting in the lobby of a doctor's office. I watched as a little girl was reunited with her mom after a short separation. The girl turned around and when she saw her mother standing there she smiled and ran into her mother's arms hugging her. I almost started crying right there in the lobby. Not because it was a beautiful sight, which it was, but because I realized I'd never experienced that very thing. My child has never run into my arms, never been thrilled to see me. It hurt, so I looked away. It wasn't until later that night when I realized I have had that same experience. It may not look the same, but I do know what it's like for my child to get excited when he's reunited with me after a short separation. 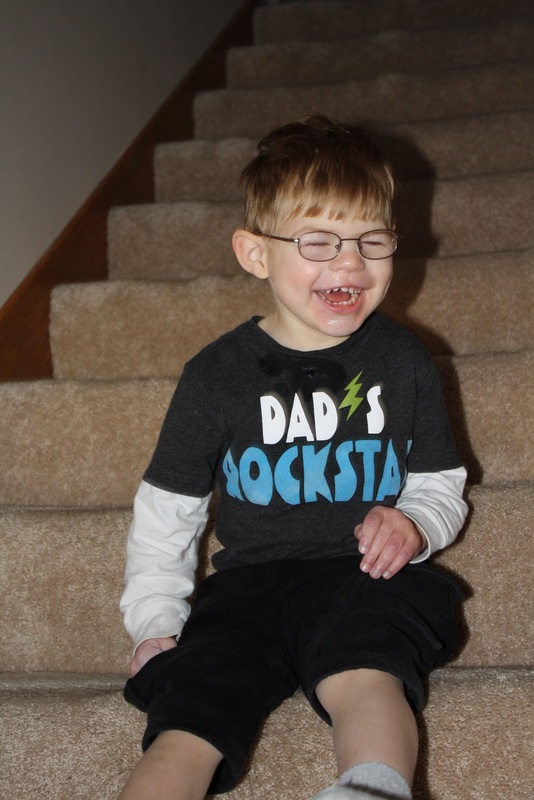 Whenever I pick Elijah up from preschool, I watch as he walks down the hallway with his teacher or teacher's aide. 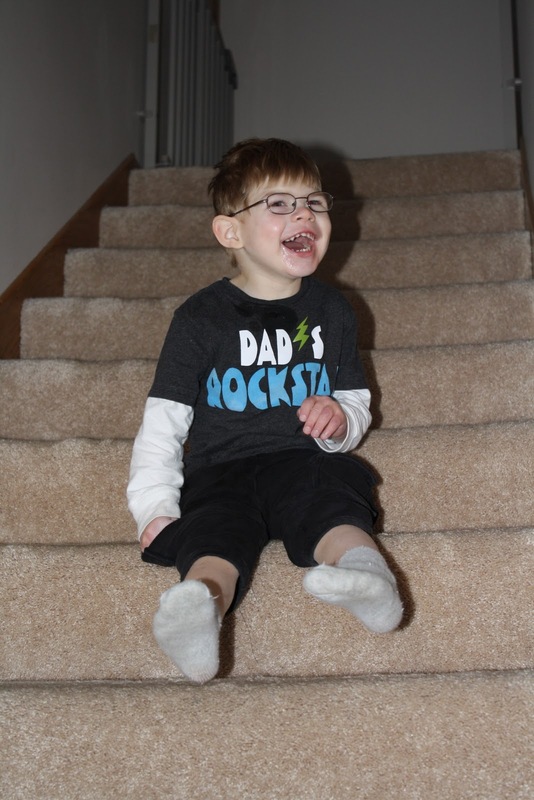 He happily stomps his feet on the floor and distractedly looks around as the teacher tries to steer him to me. I crouch down and when we're close enough that our faces are almost touching, Elijah recognizes who I am and makes his excited noise (which sounds like the noise you'd make if you were about to get into a car accident - an inhaling Huuuuuuh sound). Then he places his head on my shoulder for his version of a hug. Then there was one morning last week - I didn't want to get out of bed so Andy brought Elijah into our room and placed him in my arms. He made his same "Huuuuuh" excited sound, kissed me on my cheek and gave me the biggest hug. Unsolicited affection from our boy is rare, so I drink it in. The kid was excited to see me, which was all the caffeine I needed. So, no, my child has never run expectantly into my arms, but I do know the pleasure of our own reunion. Turns out, it's just as sweet. 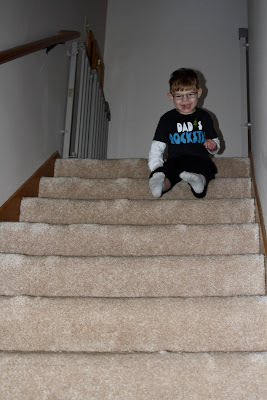 Elijah has been working on navigating our stairs for a long time. 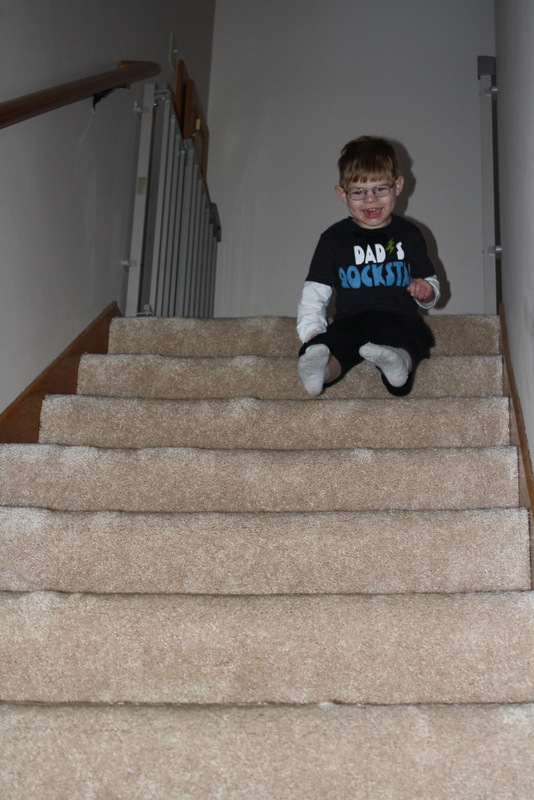 He's gotten really good at climbing the stairs. He can walk without holding onto anything, but I'm happy to report he will reach out to touch the wall for support if he needs the help. As I took pictures of him today, he kept looking back at me. And making me a little nervous about falling. And making my heart melt. Oh, the sly grin in the following photo...seriously, my heart is a pile of mush. 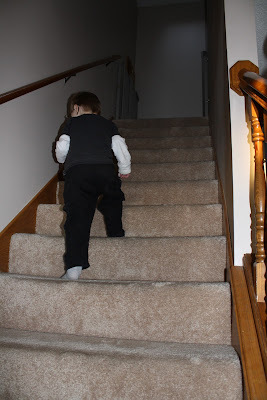 When it's time to come back down the stairs, Elijah starts out holding onto the wall. Excellent! He soon decides that sliding down on him bum is easier. And might I add - definitely a lot more fun! Oh, how I love this boy. Sometimes I can't believe he's mine. What a lucky gal am I!